Moving your college student into their first residence hall? No worries! The Parents Association will be right there with you for any questions you may have. 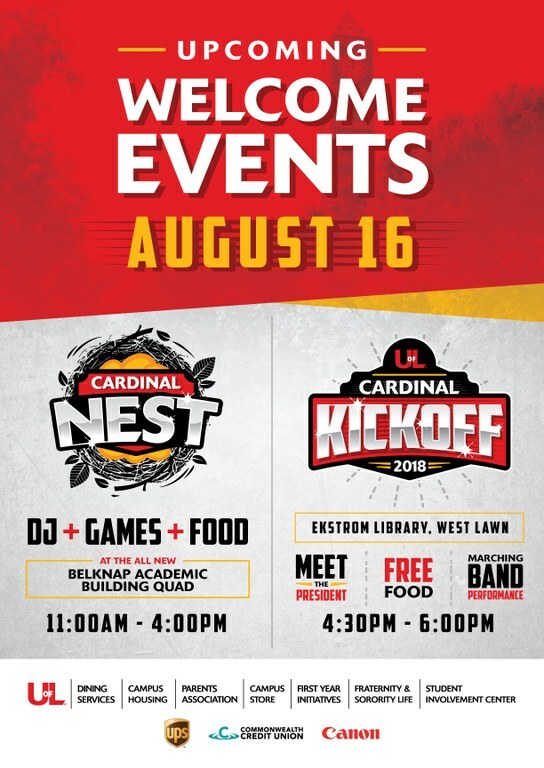 Come see us after moving your student into his or her residence hall at Cardinal Kick-off and we'll help to answer any questions you may have, provide maps of the area, and a FREE meal! Students and families are invited to celebrate the start of your student's Cardinal experience. Join us for a meal on the front lawn of Ekstrom Library as UofL’s President Dr. Neeli Bendapudi helps kick off Welcome Week. Enjoy the FREE food, a photo booth, UofL swag, Proud Parent t-shirts, music and a chance to win a new bike! Be sure to check out the August Parent Newsletter for great tips on what you should bring for Move-In.